The Bell & Gossett series e-90 features a high hydraulic efficiency and closed-coupled design and can mount either vertically or horizontally for a range of applications. It features a vacuum cast bronze impeller and a silicon-carbide mechanical seal. 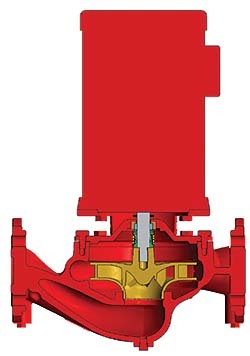 The pump is available in eight sizes, providing wide hydraulic coverage up to 300 gallons per minute (gpm) flow. It uses an industry-standard 56J motor in 1/3-3 horsepower (hp) speed and 1/2-5 hp two-pole speed. Additional features include bronze-fitted or all-bronze material construction, an ASTM B584 bronze impeller, and an EPR-carbon-silicon carbide mechanical seal.